Snow seems to bring much of the UK to a standstill. 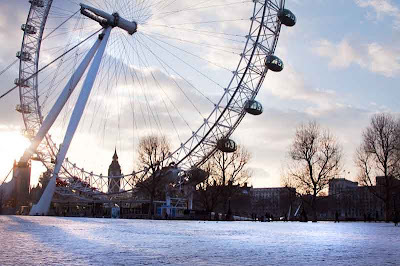 Even the London Eye is out of action for the next 2 weeks. Not sure how they will grit the sky for it to operate again. When they work out how to grit the sky, please let me know. ;-)In the mean time they can perhaps put a large plastic bag over it...? Joking aside. I think it is a superb shot and I like the angle you have chosen. Yes, the angle is very interesting, and the clouds behind it takes a bit of the edge off the "coldness" of the day. Thanks for your visit. Yes, the car is back! That's not fair! Think of the poor tourists who are out of luck! Zut, alors! It looks as if the Eye is on a tilt and about to fall over any minute now! What a great picture! Our entire amusement pack closes for the winter in October here and opens again in May, it's too risky for the rides to freeze up. I guess that much be why they closed the Eye? But in our case there's also the 'Who wants to go flying down a roller coaster when it's -15 Celsius anyway???' factor. Yeah, that would be kind of nippy. Nice framing of this image, with Big Ben in the background. «Louis's» acrophobia has kept him from riding the Eye on his visits to Londres! How do you manage to get shots that make London look deserted? The eye looks so abandoned. Nice shot! I like the angle and the starkness. Very nice pic, love the angle ! And to think in the three years we lived there, all we ever got was a dusting that looked more like heavy frost than snow.